I’m finding that I really enjoy working with these full-size mockups. During a period where my hands are restless for a model to work on, this is something I can quickly dive into and satisfy that urge. It’s work with value that is helping me better understand my relationship with my space and will prove invaluable as I try to settle my mind on decisions that will guide changes to the composition of the layout. For a couple dollar’s worth of foamcore and hot glue, this work is proving to be money and time I consider well invested. Keeping in the spirit of screwing around, I thought I’d try creating a variation on spline roadbed based on the 3/16″ thick foamcore I’ve been using throughout these projects. It’s surprisingly rigid and I’m impressed. In about eight minutes, our host introduces us to and walks us through the work they do to load a one hundred car train. He’s obviously proud of their ability to do this in fifteen hours. If you have a few minutes, the video is professionally produced and I found it quite enjoyable to watch. Open the doors on the top of the car when it is time to load the car. These are two more things that we really can’t actually do on our tiny models but in terms of setting the pace of operations I think it could be worthwhile to provide time representing when this happens. While the switching moves are simple, in this simplicity we find time to enjoy watching their execution; time to listen to the sound of those Trackmobiles at work; and time to appreciate each model grain hopper. I enjoyed watching MaxYield’s video. I doubt I’m the intended audience but in their work I learned quite a lot that I couldn’t otherwise since I don’t work in the grain or railroad industry. I learned “why” things happen. That sense of why is important to me and I’m grateful that I stumbled across MaxYield’s video and sat there and watched it. Another powerplant. Another light bulb. I recently shared an idea I’ve been developing for an operations-based model railroad where the focus is unloading rail cars, somewhat “live”. The basic premise being to move from placing a car on a siding and leaving it to actually waiting for it to be unloaded. The idea was in response to my trying to rationalize an opinion regarding switching cars on a model railroad with what was happening on the Kennebec Central Railroad, in real life, a hundred years ago. 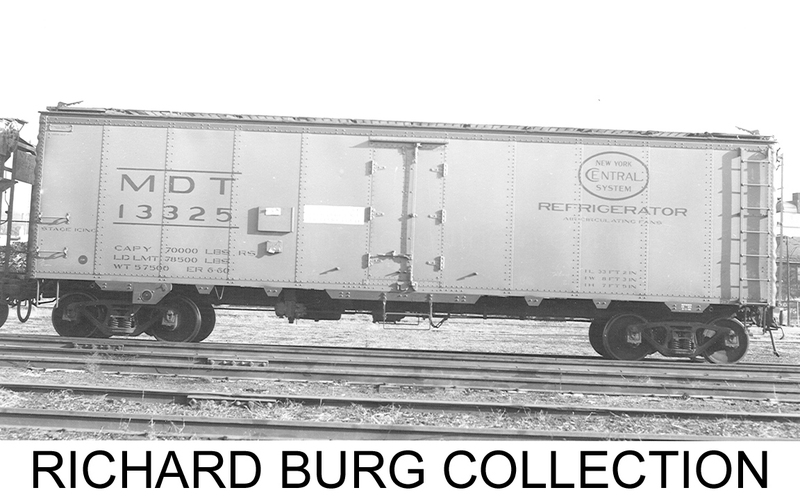 Building on the KC’s operating plan I’ve been looking for other examples such as delivering coal to the T.B. Simon power plant at Michigan State University. Click here to watch a video of their charming engine at work. The above video is of a similar theme. Another small, coal-fired power plant, and another small locomotive moving coal cars to be unloaded. If nothing else, it’s more to feed my definition of this aesthetic. As I watched the video, some further thoughts occurred to me and it’s those I wanted to share. In both the Michigan State video and the one above the engines are very similar. The former is a General Electric made 45 tonner and in this, what looks like one of GE’s 44 tonners. I quite like these particular small engines so there’s a natural attraction. Setting emotion aside, what we also have is a small engine that can really only handle three or four fully loaded hoppers of coal at one time. This means, no matter how many hoppers the railroad delivers we can only handle them four at a time. Four at a time helps us determine how much space we need on the layout since the length of four hoppers at a time, plus an engine, is the length of our train. Some basic layout dimensions fall naturally out of this factor as they become multiples of it. Four at a time also breaks the work. Modern power plants and larger scale operations can handle long trains direct from the main line. Unloading is little more than slowly dragging the train, without stopping, through the unload point. In terms of operating steps, we have little more to do than set the throttle to a slow speed and then watch. If we can only handle four at a time, we have some more traditional switching as we work through the deck of cars, waiting to be unloaded, four at a time. 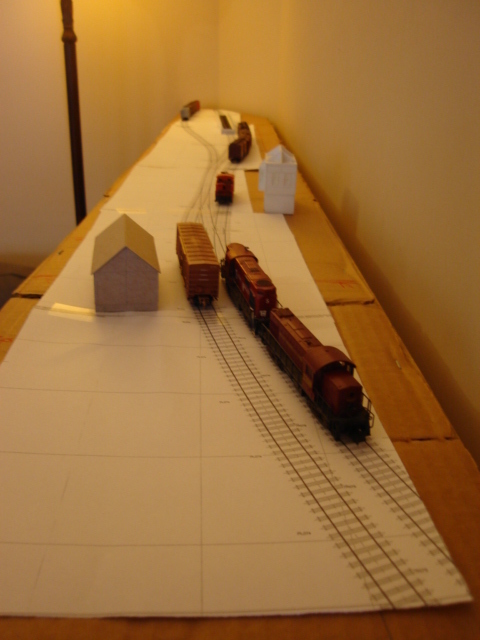 Throughout this idea, the goal isn’t simply to completely obviate traditional switching but to create an experience that brings me closer to actual work of the railroad – in this case, unloading coal – and also to ask if I could make better use of a limited space by breaking the linear relationship between the number of cars I desire to move in an operating session, the number of car spots on the layout required to support that, and then size of the model railroad required to support factors one and two. The above photo is another from a chase Steve Hunter was so lucky to be a part of following a very rare train on the western end of the Murray Harbour subdivision. Earlier, I posted a photo Steve took at Mount Albion and the above is of the train on it’s return to Lake Verde. The engines are sitting on the mainline. To their left is a short, stub-ended, public siding. The track curving away on the right of the picture is the mainline leading to Mount Stewart and ultimately, to Charlottetown. As with the Mount Albion shot, this photo illustrates so well the inspiration I’m fueling the current layout with. 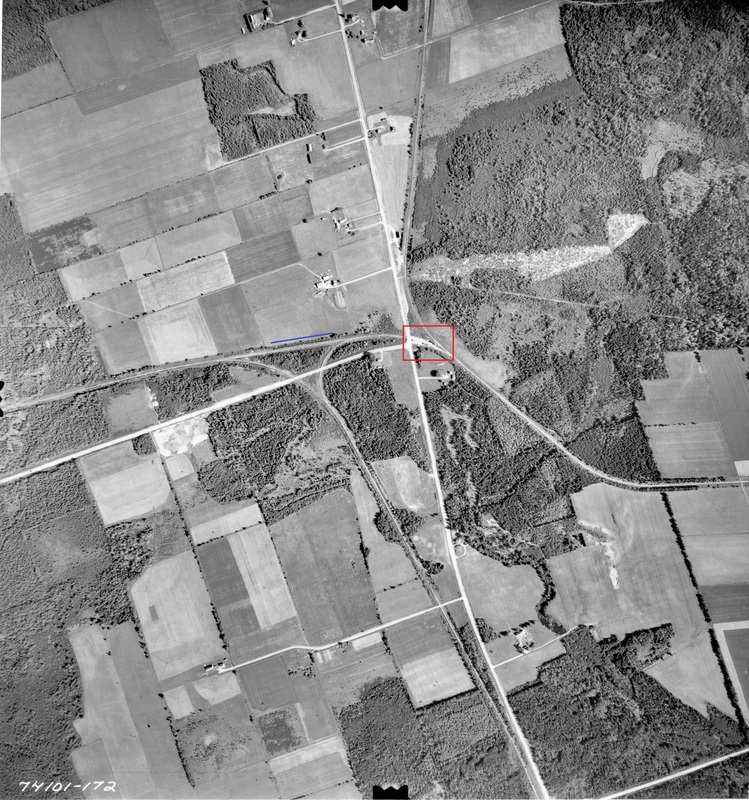 Lake Verde 1974 – red square outlines Steve Hunter’s photo and blue line highlights location of storage track. Note that the track is filled with cars waiting to be ordered for local destinations, like Mount Albion. The above aerial photo should be helpful to orient Steve’s photo. I’ve outlined where his photo was taken in a red box. While I had the aerial open anyway, I added in a blue line to draw attention to a string of refrigerator cars that had been placed here at Lake Verde. They aren’t placed to load but are staged for nearby stations so once they are ordered, they can be moved into position more efficiently. I’ve wanted a layout focused on Lake Verde for some time. I really want to develop the siding in the foreground of this photo, relying very heavily on what Steve recorded in his picture (for reference, the RS1 and RS11 in the above photo are on the main, the brown boxcar is on the Lake Verde public siding. The engines have just placed cars on the storage track for later distribution). I spent a lot of time frustrated by not having the room to really model, directly, something like the western end of the Murray Harbour subdivision or any of the other myriad of inspiring prototypes that have caught my attention. It’s not hard to see the many ways that what I’m doing is not at all like the way the prototype was laid out, but, many of those car movements that so fascinate me I can replicate very accurately here. The entire scene doesn’t feel busy in any way and I’ve spent enough time squinting down paper templates to know that in a pile of ways, these scenes remind me of the ones that inspired me in the first place. I didn’t start out intending to model this scene but it’s becoming harder and harder to ignore just how well it works if I did.